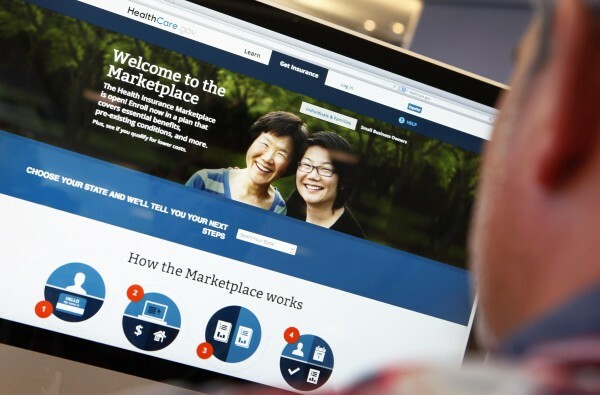 A man looks over the Affordable Care Act signup page on the HealthCare.gov website in New York in this Oct. 2, 2013 photo illustration. U.S. consumers eligible for Obamacare health plans could see double-digit price hikes next year in states that fail to draw large numbers of enrollees for 2014, including some states that have been hostile to the health care law, according to insurance industry officials and analysts. The early estimates come as insurance companies set out to design plans they intend to sell in 2015 through the state-based health insurance marketplaces that are a centerpiece of the Affordable Care Act, President Barack Obama’s signature domestic policy achievement that is widely referred to as Obamacare. WellPoint Inc., which sells plans on 14 Obamacare exchanges, expects health insurance rates nationwide to be higher. Increases for the Obamacare market that has signed up about 5 million people to date are expected to outpace those in the employer-sponsored market, which serves about 170 million people. “Looking at the rate increases on a year-over-year basis on our exchanges, and it will vary by carrier, but all of them will probably be in double digit plus,” Ken Goulet, president of WellPoint’s commercial business, told investors in New York on Friday. The cost of health insurance is already a political hot potato in this year’s election campaign for control of Congress, with Republicans warning of the potential for skyrocketing rates in their attempt to turn the ballot into a referendum on Obamacare. Insurers have noted the difficulty of building and pricing plans for 2015, which will mark the second year of the Obamacare exchanges. Enrollment for 2014 closes on March 31, giving them very little time to review the costs of covering their new members before submitting proposed rates to insurance regulators in May and June. Industry officials and independent analysts say the lack of hard data will mean huge variations in premiums, with increases ranging from the high single-digit percentages in some states to as much as 30 percent in others. Slow enrollment is a potential harbinger of big price hikes in over a dozen states, where technology failures or political opposition to Obamacare may have deterred younger and healthier residents from signing up. Because the healthcare law prevents insurers from charging sick people higher premiums, the participation of healthy young people is needed to offset the cost of covering policyholders with pre-existing conditions. Government data so far have shown about 25 percent of new Obamacare enrollees are in the younger demographic of adults aged 18 to 34, well below the White House’s 38 percent target before last October’s botched rollout. Some analysts say the more dire industry expectations reflect companies’ uncertainty rather than the true costs of the market. “I think it’ll be the exception. But there will be some sections of the country with significantly higher insurance premiums,” said Larry Levitt, a policy expert at the nonpartisan Kaiser Family Foundation, which tracks health care trends. Levitt predicts that most states will see premium increases of 7 percent to 10 percent in 2015, as insurers compensate for factors including the rising cost of medical services and reduced funding for a temporary federal program that compensates insurers for high claim costs. Levitt and other analysts said competition between plans should also brake upward price momentum in most states, while some consumers should also benefit from aggressive state insurance regulators unwilling to allow big cost hikes. Even after the end of open enrollment, a steady stream of new customers is expected to transition into the Obamacare marketplaces throughout 2014, due to life changes that allow for special enrollments, including job loss, marriage and parenthood. As a result, insurers could find themselves under constant pressure to keep prices competitive. “There’s going to be this continuing need to market and get new enrollees,” said Sarah Thomas, research director at the Deloitte Center for Health Solutions. “I wouldn’t be surprised to see higher rates in markets where there’s not as much competition. But I also wouldn’t be surprised if it’s not as bad as some of the CEOs are making out,” she said. The highest rate increases are expected among states whose marketplaces have little competition between insurers, low enrollment and hands-off regulators who do little to influence insurer decisions. Another contributing factor could be a decision by states to allow insurers to keep older health plans on the market that do not comply with Obamacare, an option offered by the President following a public outcry over policy cancellations. “In California, where enrollment has been so strong, it’ll probably be easier for actuaries to feel confident about their pricing, versus states where enrollment is very anemic,” said Dan Mendelson, chief executive at the consulting firm Avalere Health. One metric of enrollment success — and a potential indicator of future rate increases — is market penetration. In 16 states, sign-ups represent less than 10 percent of the potential marketplace population, according to a Kaiser Family Foundation study of enrollment data released by the administration on March 1. Analysts say those markets could skew toward older, sicker members, which raises the likelihood of rate increases. The list includes Republican-led states that have rejected Obamacare: Louisiana, Texas, Kansas and Oklahoma. But also on the list are Democratic states with marketplaces that have been stalled by technology problems: Massachusetts, Hawaii and Maryland. At the top of the enrollment success scale, Kaiser found that Vermont has enrolled 54 percent of its potential market, while California, Idaho, Maine, Michigan, New York, Rhode Island and Washington have each enrolled about 20 percent or more.